Recognised as an effective stimulant. 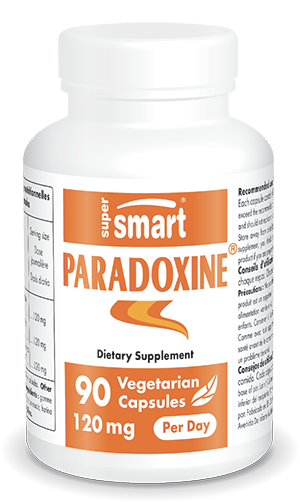 Our dietary supplement Paradoxine® is formulated from an extract of grains of paradise (Afromomum melegueta). Also known as melegueta pepper or alligator pepper, grains of paradise is a perennial plant which, like ginger, is part of the Zingiberaceae family. It is native to West Africa where it is widely used both for its digestive benefits and aphrodisiac properties. The beneficial effects of Aframomum melegueta are primarily linked to the presence of an active phenol compound called 6-paradol. It is this compound which is responsible for the plant’s spicy taste, similar to that of ginger. The structure of 6-paradol is also close to that of some of the compounds found in ginger, such as zingerone, 6-gingerol and 6-shogaol. 6-paradol has been shown to be a powerful antioxidant which may also have a fat-burning effect in the body. This is why grains of paradise is often used as a natural fat-burner. The weight loss benefits of grains of paradise have been the subject of numerous scientific studies. These have shown that supplementing with this plant extract may not only constitute a gentle way of fighting the accumulation of fat, but may also attack existing body fat reserves. Scientists attribute these benefits to the presence of 6-paradol. It may trigger thermogenesis of brown fat tissue, which in turn stimulates weight loss. As highlighted in our article on the Top 10 Slimming Plants, there are a number of star performer plants with fat-burning effects. However, grains of paradise is often chosen over others because of its efficacy at reducing adipose tissue and its absence of unwelcome side-effects. Other natural fat-burners contains substances such as caffeine, or capsaicin in chilli peppers, to which some people are sensitive and which in some cases can have a negative effect on the central nervous system. As well as its slimming effects, extract of grains of paradise offers other health benefits. For example, it is recognised as an effective stimulant. Some scientists believe it has greater aphrodisiac activity than Piper guineense which is used to treat erectile problems. Other studies have looked at the plant’s properties, specifically the mechanisms of action of 6-paradol. According to such research, this compound may help combat glycation processes and have an anti-tumour effect in the body. Our dietary supplement is formulated from an extract of grains of paradise standardised to 12.5% 6-paradol. Available in capsule form, this slimming supplement can now be purchased from our website. The suggested dose is three capsules a day which is equivalent to an optimal intake of 15mg of 6-paradol. This dose can be adjusted in line with your therapist’s advice. adults. Take one capsule after each meal. Each capsule contains 40 mg of Paradoxine®.